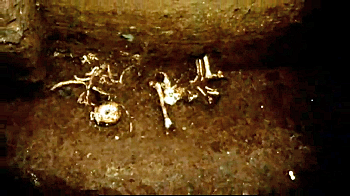 Broadcast (2005) On the far-flung island of Flores, in the Indonesian archipelago, a team of archaeologists happened upon a tiny 18,000-year old skeleton. It was no more than a metre tall. They assumed they have found the remains of a young girl. But other signs suggested she was in fact much older. They had discovered one of the smallest human adults ever found. As the dig continued, the evidence unearthed got stranger. The diggers found elephants the size of cows, rats the size of dogs, lizards the size of crocodiles. It was like stepping with Alice into Wonderland. It was not just the humans that were peculiarly sized, everything large had shrunk and everything small had grown. Further digging uncovered spear points scattered among the bones of the pygmy elephants that appear to have been roasted on fires. It seemed that their tiny human must have been a skilled and intelligent hunter. Yet when they looked more closely at her skeleton, they discovered her brain was smaller than any other known human and no bigger than a chimpanzee's. The team began to realise they had discovered a new species of human being. They called her the Hobbit. She was the smallest known species in modern human history. She lived at a time during which we previously thought we were the only species of human left on the planet. She seemed intelligent even with an animal-sized brain. She was someone worlds apart from everything understood about our ancestry, who challenged what it means to be human. The Hobbit was hailed as the scientific sensation of the century. But the discovery team could have made a monumental mistake. Scientists began to wonder whether the Hobbit was in fact nothing more than a modern human, but a sick one. A team of Indonesian biologists headed deep into the Flores jungle on a mission to find pygmies who might be the Hobbit's living descendants. They were convinced that they found them. An evolutionary scientist retraced the trail of clues that led her to one of the oldest anatomical collections in the world and the discovery of a diseased but tiny human skeleton. Another expert brought the Hobbit's brain back from her grave and subjected it to the rigours of cutting-edge brain scan technology. You might also like: Sky Archaeology or just flyby the Index page, and discover your topic.